The 2015 College Football Preview has covered both the Mid-American Conference and Mountain West Conference Preview. Now, we are up to Conference USA and this section will look specifically at the East Division. Below is a schedule for each conference and division in the 2015 College Football Preview. Let’s take a closer look at the C-USA East Division. Western Kentucky finished 4-4 in C-USA play in 2014 while finishing in a three way tie for third. They also were the only team to beat Marshall in 2014 with the crazy 67-66 win in overtime. Will 2015 be even better for WKU in Jeff Brohm’s second season? There will be 7 starters back for a potent WKU offense that average 44.4 points and 535 yards per game in 2014. That number includes the quarterback, running back, and top two receivers. Brandon Doughty threw it all over the field in 2014 with 4,830 yards with 49 touchdowns and 10 interceptions while completing 67.9% of his passes. He will have his top targets in Jared Dangerfield (69 catches for 825 yards and 11 touchdowns) and Taywan Taylor (45 catches for 767 yards and touchdowns) to throw to. At running back will be Leon Allen, who ran for 1,542 yards and 13 touchdowns while also grabbing 51 catches for 476 yards and 3 touchdowns. The offense will be high-flying once again for the Hilltoppers. Defensively, WKU gave up 39.9 points and 510 yards per game in 2014 with only four starters back. That number more than doubles in 2015 to nine starters back as well as the top four tacklers. The two losses are at outside linebacker and cornerback, but the replacements have plenty of experience including Wonderful Terry (yes that is his name) at CB. He was 2nd Team-C-USA in 2014 after playing in 12 games and recording 43 tackles, 3 tackles for loss, 6 pass breakups, and 2 interceptions. The entire defensive line returns, but they will need to do better than the 221 rushing yards per game they yielding last year. They will also be backed up by two returning linebackers that were #1 (Nick Holt) and #2 (Dejon Brown) in tackles. The previously mentioned secondary returns three starters and the entire defense should perform better this year than in 2014. The schedule is not as kind to WKU as they would have hoped. They face a road game at Vanderbilt in the opening before the conference opener at home against a tough Louisiana Tech team. Next up is a road game at Indiana before a home game against Miami (OH). They also have a road game against Rice from the West Division, road game at LSU near the end of October, but get Marshall at home to end the regular season. That game should determine the winner of the East Division and we will call WKU as that winner. Marshall nearly had a magical season in 2014 with a chance to make a New Year’s Six game. However, they lost to Western Kentucky in the regular season finale before bouncing back to win the C-USA Championship and crushing Northern Illinois in the bowl game. In 2015, Marshall will be hit heavily on offense with the losses being Rakeem Cato at quarterback and Tommy Shuler as the top receiver in 2014 with six starters turning. Replacing Cato will be either Michael Birdsong or Gunnar Holcombe, but they will not be putting up the same stats at Cato. Devon Johnson will be returning in the backfield to help out the new QB and he ran for 1,767 yards with 17 touchdowns in 2014. The Thundering Herd will miss their top receiver, but have the #2 (Davonte Allen), #3 (Angelo Jean-Louis), and #4 (Deon-Tay McManus) receivers as well as three offensive lineman. The offensive will not be nearly as potent (45.6 points and 559 yards per game) as it was with Cato leading the show. 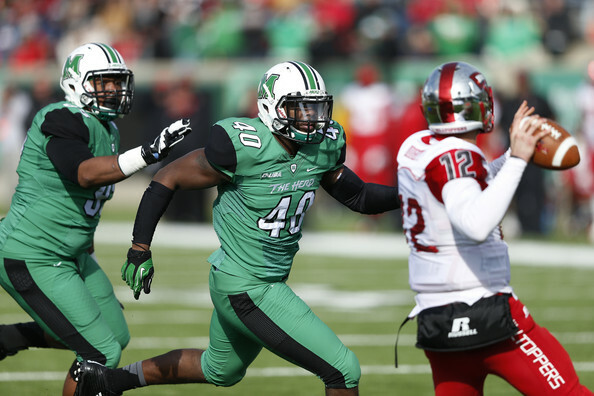 Marshall has only five starters back on defense from a unit that allowed 21 points and 357 yards per game in 2014. The defensive line was hit hardest with three starters gone and Jarquez Samuel as the only returning starter (30 tackles, 1 sack, 4 tackles for loss). Linebacker was also hit hard with the top two tacklers from 2014 gone and the only starter back is DJ Hunter. Hunter, originally at Tennessee, recorded 80 tackles, 5.5 sacks, and 4.5 tackles for loss in 2014 and should have a big season again. The strength for Marshall on defense will be the secondary that returns three starters from a unit that only allowed 197 yards passing and 54.5% completions last year. They will be key to helping the front seven gel early in the season. Overall, the defense will take some steps back with the loses. Marshall has a pretty easy out of conference schedule with a home game against Purdue, road trip to Ohio, home game against FCS Norfolk State, and road trip to Kent State. A 3-1 record is probable in that stretch. In C-USA play, they draw North Texas and Southern Miss from the West with both of those games at home. The do have to travel to Western Kentucky in the regular season finale and it would not be surprising to see them end up in the C-USA Championship Game. 2015 will mark head coach Rick Stockstill‘s 10th season in charge of Middle Tennessee. He has seen them progress from the Sun Belt to C-USA. He has also been in charge for all four of Middle Tennessee’s four bowl appearances (1-3 record). Will 2015 be the fifth bowl game for Middle Tennessee and Rick Stockstill? The offense will return eight starters from 2014 including quarterback Austin Grammer, who threw for 2,557 yards (65.4%) with 17 touchdowns and 12 interceptions. Brent Stockstill (son of Rick) could also see playing time. The top running back is gone for the Blue Raiders, but the second, third, fourth, and fifth leading rushers are back, which should soften the blow. The top and third leading receiver are also gone, but the offense was spread out evenly in regards to passing so the losses are not as detrimental while four starters return on the line. After averaging 31.6 points and 431 yards per game in 2014, a similar output can be expected in 2015. The defense, like the offense, returns eight starters with the losses spread out evenly (one loss on the line, at linebacker, and in the secondary). The defense will be led by Will linebacker TT Barber, who had 72 tackles, 1 sack, 6.5 tackles for loss, and 2 interceptions while being named to C-USA’s 2nd Team. The defensive line allowed 183 rushing yards per game and a 4.3 yards per carry average with the number expected to improve with nearly all of their major players back. The secondary is headed by strong safety Kevin Byard, who was named to the 1st Team All-C-USA squad after putting up 66 tackles, 3 tackles for loss, and intercepting 6 passes last year. The defense should be solid for Middle Tennessee. Middle Tennessee will face three Power 5 conference members in the opening five weeks with games at Alabama and Illinois before Vanderbilt comes to town. They also have Jackson State in the opening week and a home game against Charlotte in Week 3. From the West division they draw Louisiana Tech (road), North Texas (home), and Texas-San Antonio (road) while facing East contender Western Kentucky on the road and Marshall at home. Middle Tennessee can expect another bowl appearance in year 10 under Stockstill. Florida International has improved in the first two years under Ron Turner going from 1-11 in 2013 to 4-8 in 2014. The offense and defense both improved as well. The offense went from averaging 9.8 points per game in 2013 to 23 points per game in 2014 while the defense went from surrendering 37 points per game in 2013 to 24.8 points per game allowed in 2014. Year three should continue that trend. The offense will be returning seven starters from a year ago including Alex McGough at quarterback. As a true freshman in 2014, McGough threw for 1,680 yards with 14 touchdowns and 10 interceptions while completing only 50.4% of his passes. Those numbers are far from overwhelming, but he should improve in year two of this offense. McGough will also benefit from the top three rushers returning led by the duo of Anthon Samuel and Alex Gardner. Both rushed for exactly 582 yards on the ground while Samuel had 5 touchdowns and Gardner scored only once. That duo should also improve. Jonnu Smith, the top receiver in 2014, is back as well after grabbing 61 passes for 710 yards and 8 scores. If McGough and the offense can find consistent second and third receivers, they will put up even better numbers in 2015. The defense returns eight starters including the second, third, and fourth leading tacklers as well as eight of the top ten tacklers from 2014. Six of the front seven return including C-USA Freshman Team member Anthony Wint (48 tackles and 0.5 tackles for loss). The defense gave up only 160 yards rushing per game including 4.1 yards per carry. That should be the case again in 2015. The secondary loses two players at the safety spots so it will be on the corners, Richard Leonard (1st Team C-USA) and Jeremiah McKinnon, to shut down the top opposing receivers. It should be another solid year, if not better, for FIU on defense. FIU has a somewhat difficult out of conference schedule with back-to-back road games at Central Florida and Indiana before a home game against FCS North Carolina Central. They have a tough draw after that with back-to-back road games again, this time against Louisiana Tech from the West Division and Massachusetts from the MAC. They also draw UTEP out of the West division and will have the duo of Marshall (road) and Western Kentucky (home) to end the regular season. FIU looks poised to reach bowl eligibility and get back to a bowl game for the first time since 2011. 2014 marked the first season of Old Dominion in Conference USA and it is hard to call it anything but a success. They played 11 FBS teams and finished 6-6 including some incredibly entertaining games against North Carolina State, Rice, UTEP, Western Kentucky, and Vanderbilt. Old Dominion is now no longer the newcomer to the conference in 2015 thanks to the addition of Charlotte. Eight starters are back on offense for ODU, but two of them are key losses. Quarterback Taylor Heinicke (3,476 yards with 30 touchdowns and 16 interceptions) and wide receiver Antonio Vaughn (63 catches for 1,019 yards and 12 touchdowns) have both departed. Quarterback duties will ended up being handled by redshirt freshman Shuler Bentley, true freshman Blake LaRussa, junior Colin McElroy, or Greyson Lambert. The quarterback may put up solid numbers, but it will be hard to replace Heinicke. Running back Ray Lawry returns after a successful freshman campaign in which he ran for 947 yards and 16 touchdowns on only 134 attempts (7.1 yards per carry average). He will have four of the same offensive lineman from last year to help pave the way. The loss of Vaughn at wide receiver will hurt, but there are plenty of experienced players to help soften the loss. Zach Pascal had 59 catches for 743 yards and 7 touchdowns while David Washington caught 47 passes for 599 yards and 4 touchdowns. Overall, the offense could produce similar numbers of 32.7 points and 442 yards per game if the quarterback grasps the offense quickly. 2014 saw 10 starters return on defense, but they still gave up 38 points and 452 yards per game against a mostly FBS schedule. That is to be expected, but now the returning starters is halved to five. The defensive line was hit hard with only one returning starter in Poncho Barnwell, who had 34 tackles, 3.5 sacks, and 3 tackles for loss. Linebacker loses two starters as well with middle linebacker TJ Ricks returning to anchor the unit. Ricks had 80 tackles, 2.5 sacks, and 4.5 tackles for loss last year. The secondary allowed 230 passing yards and 68.6% completions and returns two starters at the safety spots. The defense may improve on the numbers a bit in 2015, but are still in the process of trying to make the entire roster full of FBS players. Old Dominion has quite a few home non-conference games. They start with Eastern Michigan on the road before getting Norfolk State, North Carolina State, and Appalachian State on the road. A 2-2 or 3-1 record will put them in good position because they open C-USA play on the road at Marshall. From the West Division they get Texas-San Antonio, UTEP, and Southern Miss while games against Charlotte (home), FIU (road), and Florida Atlantic (home) will decide if they have at least six wins in 2015. Florida Atlantic thought they had found their man in Carl Pelini until some rather unsavory allegations led to his departure from FAU during the 2013 season. FAU hired Charlie Partridge prior to the 2014 season he guided the Owls to a 3-9 record with only 11 starters returning. In 2015, there will be six starters returning on offense led by quarterback Jaquez Johnson. Johnson threw for 2,215 yards (57.8%) with 17 touchdowns and only 5 interceptions. He also ran for 513 yards and 7 touchdowns as the second leading rusher on the team. The top rusher, Jay Warren, also returns after running for 571 yards and 2 scores. Out of the top four receivers from 2014, only Jenson Stoshak returns. Stoshak was the second leading receiver with 37 catches for 508 yards and 2 touchdowns. After putting up 24 points and 363 yards per game in 2014, FAU should put up similar numbers, if not higher. On defense, there are still some issues to work on after yielding 34.4 points and 461 yards per game in 2014. Six starters return, the same number that returned in 2014, but the back seven has been decimated with only two returning starters. The entire defensive line returns as well as Rutgers transfer Nick Internicola. The front four should improve vastly on the 222 rushing yards per game and 5.5 yards per carry average they gave up last year. The linebackers have only one returning starter in Robert Relf, but he was the #4 tackler in 2014 after making 65 stops and 1.5 tackles for loss. The secondary has Cre’Von LeBlanc and Sharrod Neasman back, which will help shore up some of the inexperience issues. The defense will probably have a few struggles throughout the season. FAU opens the season on the road at Tulsa before a home game against Miami (FL). They have another home game against Buffalo before a road trip to Charlotte. Their final non-conference game is at Florida on November 21. In conference, FAU has to face Rice (home) and UTEP (road) from the West. FAU will get close to bowl eligibility, but is probably a year away from getting back to a bowl game. Charlotte has only been playing football since 2013 and have racked up a pair of 5-6 seasons against FCS, Division 2, and Division 3 opponents. 2015 will mark their first time against an FBS opponent and they will have 11 of them. Brad Lambert is in charge of the 49ers and has been with the program since its inception. Charlotte will have 9 starters back on offense from a team that scored 38.8 points per game and put up an average of 487 yards a game. Matt Johnson threw for 1,941 yards with 13 touchdowns and 8 interceptions before an injury against James Madison knocked him out for the season. His top two targets are back including Austin Duke, who had 79 catches for 1,373 yards and 9 touchdowns. Added into the mix is former Georgia Bulldog Uriah LeMay. Kalif Phillips ran for 1,436 yards and 20 touchdowns behind an offensive line that returns four starters. The offense will not put up the same numbers it did in 2014 thanks to tougher opponents. The defense returns 8 starters from a unit that allowed 31.6 points and 477 yards per game in 2014. The front three will be back after allowing 193 rushing yards and 4.2 yards per carry in 2014. The linebacking unit has two losses and two returning starters, which will hurt them against FBS competition. Three of the four starters from 2014 return in the secondary including Branden Dozier, who had 86 tackles, 11 pass breakups, and 1 interception in 2014. Despite the experience coming back, the defense will probably see worse numbers this year. As mentioned in the opening paragraph, there will be 11 FBS opponents this year for Charlotte to face. They start with a game at Georgia State before playing at home against FCS Presbyterian. They face back-to-back C-USA opponents in weeks three and four before a home game against Temple. Their last non-conference game is against Kentucky in the penultimate weekend in November. Things will be tough for Charlotte in their first C-USA season with their best chance to win in conference against FAU on September 26 or Texas-San Antonio on November 14. It could be a double digit loss year for Charlotte as they get acclimated to playing in the FBS. The Conference USA East Division is headed for a showdown between Marshall and Western Kentucky to determine the division champion. It just so happens to be that those two teams meet in the regular season’s final weekend (November 27) prior to the Championship game the following week. Middle Tennessee, Florida International, and Old Dominion look to be headed towards bowl eligibility while Florida Atlantic may come up just short. Charlotte will have a tough time in their inaugural season in C-USA. Below is the predicted order of finish. Check back on Friday, July 17 for the Conference USA West Division preview as well as the predicted winner of the C-USA Championship game.